I like this guy — the more I hear what he has to say, the more I think he’s an up and comer. 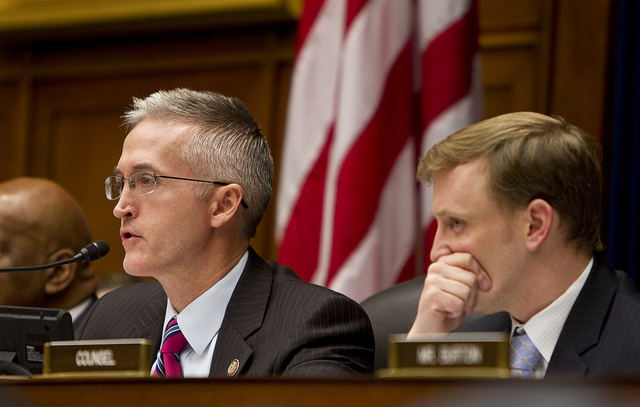 Pay attention to Trey Gowdy of South Carolina. From Katie Pavlich writing at Townhall. “There’s no use to having the majority if you are going to be hamstrung by your perception of political vicissitudes,” said Rep. Trey Gowdy of South Carolina , who was at the dinner. The feeling was best illustrated Wednesday at the Capitol Hill Club, a private GOP haunt adjacent to the Republican National Committee’s offices. More than a dozen conservative lawmakers — including Republican Study Group Chairman Jim Jordan of Ohio — met there for dinner, and the topic of conversation veered toward how to push leadership to pursue a “more profound direction” forward, according to several lawmakers in attendance. The main topic: Why, conservatives ask, is the party holding back when it has spent a year waiting — fruitlessly — for Holder to comply with a subpoena? One example of such pressure on leadership is coming soon. Conservatives — primarily those on the House Oversight and Government Reform Committee — are circulating a letter to Boehner pressing him on his handling of the “Fast and Furious” scandal. During a private meeting with Cantor and Majority Whip Kevin McCarthy (R-Calif.), Boehner decided to slow the pace of Committee Chairman Darrell Issa. But the speaker also said he supports holding the administration accountable and said he’s open to all options in the investigation of the botched Fast and Furious program, in which guns were sold to Mexican cartels, resulting in deaths of federal agents. Issa and his committee expected to vote on the contempt citation this week, according to lawyers who were preparing for a hearing. Boehner has no excuse on this one. It is the Constitutional duty for the U.S. Congress to oversee and hold the Executive branch accountable; basic balancing of power. Eric Holder and officials in his Justice Department have done nothing but obstruct Congress is their efforts to fulfill that duty. There are thousands of people dead in Mexico and two federal agents dead as a result of Fast and Furious. Simply avoiding contempt charges for Holder to avoid a political dust-up with the Obama administration would be pathetic and a denial of justice for the American people and the victims of this reckless program. To be fair, Boehner did come out for the first time publicly last week to announce his support of the investigation into Fast and Furious being led by Chairman Darrell Issa saying, “All options are on the table,” in reference to contempt charges for Holder. We’ll see if actions follow.